Not to be confused with mincemeat. Not to be confused with MINCE. Ground meat (called mince or minced meat outside North America) is meat finely chopped by a meat grinder or a chopping knife. A common type of ground meat is ground beef, but many other meats are prepared ground in a similar fashion, including pork, lamb, and poultry. In South Asia, both lamb (mutton) and goat meat are also minced to produce keema, though the process of mincing is manual. Ground meat has food safety concerns not associated with whole cuts of meat. 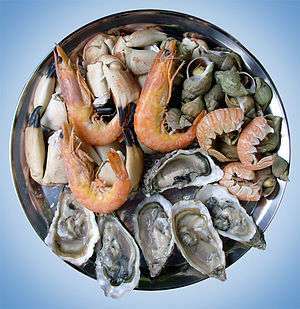 If undercooked, it can lead to sickness and food poisoning. 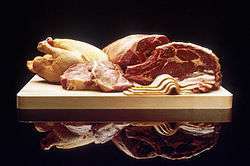 In a whole cut from an animal, the interior of the meat is essentially sterile, even before cooking; any bacterial contamination is on the outer surface of the meat. When meat is ground, bacterial contamination from the surface can be distributed throughout the meat. If ground beef is not well cooked all the way through, there is a significant chance that enough pathogenic bacteria will survive to cause illness, moreover the warming will speed the reproduction of bacteria. Undercooked Jack in the Box hamburgers contaminated in this manner were responsible for four deaths and the illness of hundreds of people in 1993. To ensure the safety of food distributed through the National School Lunch Program, food banks, and other federal food and nutrition programs, the United States Department of Agriculture has established food safety and quality requirements for the ground beef it purchases. A 2010 United States National Research Council report reviewed the scientific basis of the Department’s ground beef safety standards, evaluated how the standards compare to those used by large retail and commercial food service purchasers of ground beef, and looked at ways to establish periodic evaluations of the Federal Purchase Ground Beef Program. The report found that although the safety requirements could be strengthened using scientific concepts, the prevention of future outbreaks of food-borne disease will depend on eliminating contamination during production and ensuring meat is properly cooked before it is served. Wikimedia Commons has media related to Minced meat. ↑ Committee on the Review of the USDA E. coli O157:H7, "Farm-to-Table Process Risk Assessment", Slaughter Module in Escherichia coli O157:H7 in Ground Beef: Review of a Draft Risk Assessment, 2002, The National Academies Press, Washington, DC. ↑ Honikel, K. O., "Minced Meats", in Encyclopedia of Meat Sciences, Jensen, W. K., et al., eds., 2004, Elsevier, New York.